A chilling horror film that is both a psychological and physical terror ride, Carrie combines the worst nightmares of any young girl: awkward puberty, bullying by the meanest of classmates, parental religious terrorism, and prom night turning into torment. That Carrie White discovers a way to extract a brutal revenge on all who abuse her through telekinesis just makes Brian De Palma's task of creating a frightfest so much more fun. 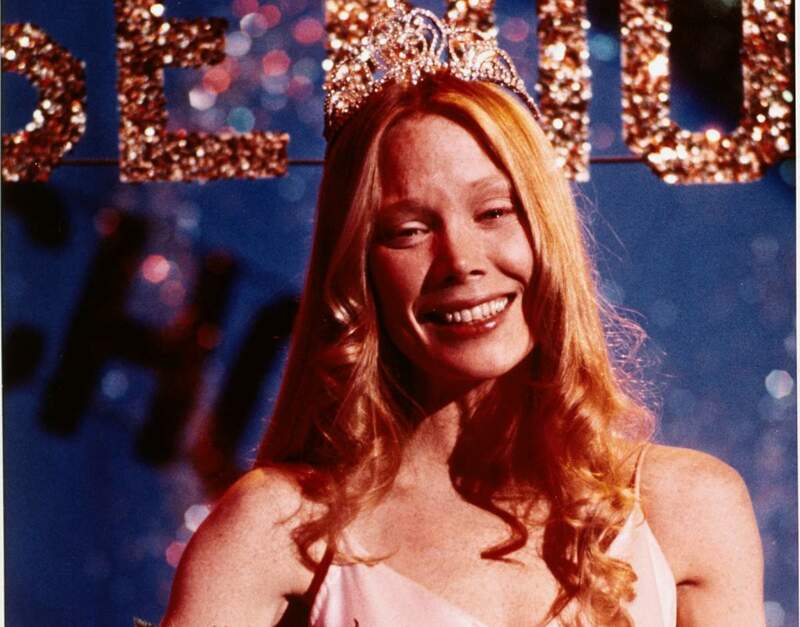 Based on the Stephen King novel, the movie opens with withdrawn and friendless high schooler Carrie White (Sissy Spacek) discovering her first period in the gym shower, and being traumatized when her mean classmates, including Chris (Nancy Allen) and Sue (Amy Irving) throw tampons at her. As the gym teacher Miss Collins (Betty Buckley) tries to make amends and help Carrie out of her shell, Carrie begins to discover that she has the telekinetic power to physically move objects through mind control. Carrie's real problem is her uncompromisingly stern mother Margaret (Piper Laurie), a sexually repressed religious zealot who abuses her daughter. Sue feels some regret at the mistreatment of Carrie, and to make amends, convinces her popular boyfriend Tommy (William Katt) to ask Carrie out to the prom. But Chris is much more intent to continue the bullying, and plots with her boyfriend Billy (John Travolta) a most humiliating climax to Carrie's prom night. Carrie enjoys most of her evening with Tommy, the one and only successful social event in her life, but when Chris turns the prom from dream to nightmare, Carrie unleashes her telekinetic power to extract a most violent revenge. 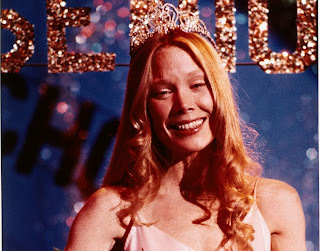 Sissy Spacek was 26 years old when she portrayed high school student Carrie White, and her performance is unforgettably disturbing. Acting with haunted eyes, a frail physique, and long, uncared-for hair, Spacek's sheer presence foretells disturbing obscurity and impending doom in equal measures. Spacek is matched by an unhinged, over-the-top performance from Piper Laurie as Carrie's mother Margaret, a religious fundamentalist who embraces all the most twisted interpretations of sin and guilt associated with sexuality and dumps them on her daughter. The scenes of Margaret terrorizing Carrie with her religious dogma are more disturbing than all the blood that De Palma throws onto the screen. And De Palma is the third star of the movie, using slow motion, camera rotation, and point-of-view shots to great effect. He boosts the impact of the horror sequences by juxtaposing them with tranquil scenes, or by deliciously prolonging the set-up prior to unleashing the inevitable shocks. Carrie's secondary characters are brought to life by a lively group of actors, many of whom achieved varying degrees of fame. This was John Travolta's last film prior to shooting into superstardom with Saturday Night Fever, while Nancy Allen, Amy Irving , P.J. Soles and William Katt would go to on build modestly interesting movie profiles. Betty Buckley had an excellent stage, screen and television career, and Priscilla Pointer (Irving's real-life mother) was most famous for a role on TV's Dallas. Many hidden meanings can be layered into Carrie's story, from her entire experience being a metaphor for the sacrifices of womanhood, to the societal damage caused by religious extremism and the equating of sexuality with sin. The hints of subtext bubbling below the surface provide an added edge of enjoyment to the unfolding tragedy. Carrie is a classic horror film, compact, on-target, unsettling and unforgettable.